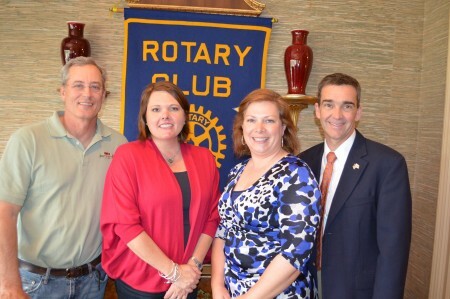 The Auburn Rotary Club recently heard from Beth Witten (third from left) and Jim Cook (second from left) about the upcoming Auburn-Opelika Air Show -- the first of its kind in the area since 1984. The air show will be at the Auburn University Regional Airport Saturday, May 11, and will feature thrilling, world-class aviation entertainment and education with in-air entertainment and on-ground interaction. Pictured with them is Club President Martee Moseley (left) and program host Bill Hutto (right). For more information, visit www.auburnopelikaairshow.com.